The GMT Fermonic Field Detector Ring is a scientific tuning device to gauge accurate settings for the successful transposition of bio-matter with moveable dial indicator. 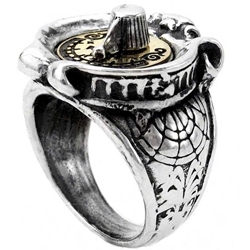 The GMT Feromonic Field Detector is a two-tone steampunk style ring of fine English pewter. Features a brass plate calibrated as a "gender gauge" and moveable pointer. The face and sides are formed in classic pseudo-industrial art deco, as if it were a miniature working instrument. This Gothic ring is made from fine English pewter.